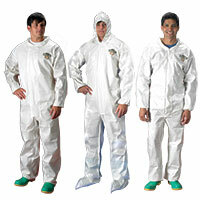 Level C Chemical Protective Clothing: ChemMAX® 2 offers quality, value, durability and the proven protection of Dow Saranex 23P barrier film protecting against hazardous chemicals and contaminants found in the work place. The unparalleled strength and softness of ChemMAX® 2 features Dow Saranex 23P film on two layers of a unique bi-component spunbond nonwoven substrate and provides protection for chemical mixing and handling, environmental clean up, hazardous materials remediation and response, pharmaceutical manufacturing, spray painting and general industry. A bound seam joins two pieces of serged material with extra material that covers the seam and is sewn in place. This provides an added layer of seam protection. Level C Chemical Protective Clothing: ChemMAX® 2 offers quality, value, durability and the proven protection of Dow Saranex 23P barrier film protecting against hazardous chemicals and contaminants found in the work place. The unparalleled strength and softness of ChemMAX® 2 features Dow Saranex 23P film on two layers of a unique bi-component spunbond nonwoven substrate and provides protection for chemical mixing and handling, environmental clean up, hazardous materials remediation and response, pharmaceutical manufacturing, spray painting and general industry. A heat sealed seam is sewn and then sealed with a heat activated tape. 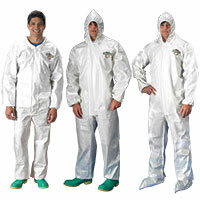 This method provides liquid proof seams, and is especially useful for Level A and B chemical protective clothing.